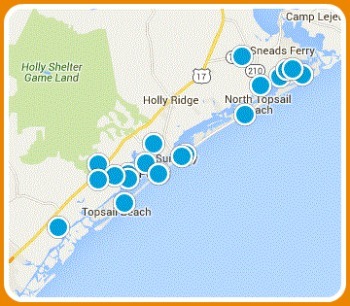 Once a sleepy fishing village, Hampstead is now one of the fastest growing communities in the Topsail Island area. Just minutes from the beaches of Topsail Island and Surf City and midway between Wilmington NC and Jacksonville FL, Hampstead is home to approximately 12,000 (and growing!) residents. Hampstead offers everything you'd expect from a waterfront community (fishing, boating and watersports abound) as well as numerous nearby golf courses and historic sites. Searching for your Hampstead dream home? You're in luck! We feature all available Hampstead homes for sale in the MLS with the most current pricing, photos and property information available. You'll also find Hampstead condos, waterfront properties, new construction and foreclosures for sale. Selling a Hampstead home? Find out what your Hampstead home is worth with a personalized property value assessment. Questions? Want to see a home in person? Contact us! Be the first to see new Hampstead homes as soon as they hit the market!